Did Ayn Rand Influence Ken Follett? Ken Follett's novels are not only inspiring and well-written, but also reveal thematic and stylistic choices similar to those in Ayn Rand's novels. Could it be more than a coincidence? 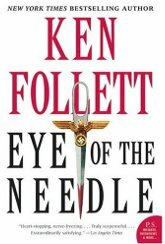 I became hooked on British author Ken Follett through his most famous novel, The Eye of the Needle. It’s the gripping World War II story of a ruthless Nazi spy’s attempt to bring secrets of the British military back to Hitler, combined with a tragic love story and a dynamite heroine. A wonderfully plotted, suspenseful story, a heroine of immense presence of mind and courage, and characters that act with strength and integrity — what’s not to like? Donald Sutherland starred in the movie version, but don’t miss the book just because you’ve seen the movie. There’s a lot more in the book. After The Eye of the Needle, I ripped through many of Follett’s other novels, including The Man From St. Petersburg, Triple, The Key to Rebecca, and Lie Down With Lions. They were all spy novels, but so much more satisfying than many contemporary authors because of the dramatic originality of the stories and because their characters have a psychological depth and self-awareness often lacking in spy novels and thrillers. Simply put, Follett is a modern master of Romanticism. I moved on from these spy stories to his historical fiction, including A Dangerous Fortune and A Place Called Freedom. The first dramatized the 19th Century banking world, the second, the enslaved life of 18th Century Scottish miners, one of whom escapes to build his life in the challenges — and freedom — of the New World. Their settings and themes, combined with the unusual level of Romanticism in his novels, began making me suspect that Follett may have been influenced by Ayn Rand. Then I read a novel of his which was entirely different from the others — Pillars of the Earth. (See my husband John Enright’s 2004 review for the Atlasphere.) This thousand-page tome recounts the lives and fortunes of 12th Century English men and women, involved in the century-long building of a cathedral. My suspicions of an Ayn Rand influence soared! The heroes in this book were the red-haired builder of the cathedral and a woman who becomes a wool merchant. An architect and a businesswoman in Medieval times? And there was the author’s positive attitude towards business and the strong independence of his heroes and heroines. However, I had nothing definitive — only a hunch due to a combination of factors about Follett’s writing. I set aside my speculations until this year, when I tore through his sequel to Pillars of the Earth, titled World Without End. Set more than a hundred years later, descendants of Pillars’ hero and heroine are instrumental in remaking their medieval town of Kingsbridge into a Renaissance of architectural and business achievements. Through his creative genius as an innovative architect, builder, and businessman, the red-haired hero, Merthin, achieves fame and fortune. He breaks through the straightjacket of the guilds and lives a uniquely independent life in a time when the church and superstition ruled most people’s thinking. The heroine, Caris, likewise bucks tradition, pursuing the work of a doctor with a very scientific approach, among many other defiant choices, and transforms the town by creating new markets and business methods. She insists on maintaining her personal independence despite tradition and tremendous social pressure. Both Merthin and Caris habitually demonstrate the close observation of facts and their rational implications — one among the many values drawing them together. And both are de facto atheists in a time of religion’s dominion. On top of this, the villains are veritable portraits of Attila and the Witch Doctor. Merthin’s brother Ralph is a brutish, power-mad knight, ruthlessly angling for social advancement. And the Priors of the Kingsbridge town Abbey, fearing reason and change, control others through shunning, persecution, appeals to their moral authority, and Ellsworth Toohey-like manipulation. In addition to themes and characters that echo Ayn Rand, certain scenes also bear an uncanny relationship to scenes in Atlas Shrugged and The Fountainhead. For example, in one scene, Caris is treating a fellow townsman for the plague: “Dora handed Caris a cup of wine, and Caris held it to Mark’s lips. She found it strange to see a big man helpless. Mark had always seemed invulnerable. It was unnerving, like finding an oak tree that has been there all your life suddenly felled by lightning.” Remember Eddie Willers’s feeling when looking at the oak tree in the opening of Atlas? However, the last scene of the book really did it to me — it parallels, in several ways, the last scene of The Fountainhead. I’ll refrain from describing it here, for fear of ruining a reader’s enjoyment. I’d love to hear what Atlasphere readers think, once they’ve read World Without End. So what is Follett’s own backstory? Born in Cardiff, Wales, Follett graduated from University College, London with an Honours B.A. in Philosophy. He first wrote as a journalist in Wales, and later, in London for the Evening News. After a number of less-than-successful novels, he struck gold with The Eye of the Needle. Brought up in a religious Welsh family, he began questioning his beliefs, which led him to philosophy for answers. Unfortunately for our purposes, this doesn’t reveal much similarity to Rand’s thinking other than that Follett is a realist. And his political leanings — the Labour Party — don’t indicate much affinity for free markets. If you get hooked on Follett, you’ll be pleased to find many more novels than the ones I’ve mentioned. And in addition to Eye of the Needle, a number of his books have been produced as movies, such as The Key to Rebecca and The Third Twin. I emailed Follett through his website, asking whether he might have been influenced by Rand, as I had discovered of novelist James Clavell, of Tai-Pan and Shogun fame. (You can read my report on Clavell here.) But I haven’t heard back from him. If I do, I’ll let Atlasphere readers know. Until then — good reading! Marsha Familaro Enright is a psychologist, writer, lecturer, and educational entrepreneur. Founder of the thriving Council Oak Montessori School in Chicago, Marsha’s latest venture is the Reason, Individualism, Freedom Institute, the Foundation for the College of the United States. 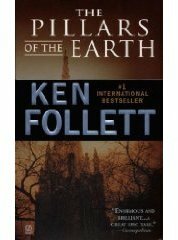 Am currently reading THE PILLARS OF THE EARTH, and have read EYE OF THE NEEDLE, which is one of my favorite novels. However, though I'm only half-way through PILLARS, I do wish that, instead of Ridley Scott producing a television mini-series based on the novel, Frank Darabont, screenwriter and director of THE SHAWSHANK REDEMPTION, would write and direct a theatrical film version of it. SHAWSHANK was the story of an innocent and intelligent man trying to survive in a maximum security prison; THE PILLARS OF THE EARTH is the story of men and women of intelligence and principle trying to survive in a much larger prison: the world of the Middle Ages. I have also read Pillars and World Without End and really enjoyed them and also wondered if the auther had read her novels. One of the recurring themes of Pillars and World is that the ruling class stymies the ambitions of those working the land - both institutionally and with direct malice. The inventive and industrious characters always run against someone who wishes to protect the established order. For example in World, the King imposed wage and price controls to combat inflation due to the plague reducing labor supplies. Also, Follett's heroes are the inventors of industries that hundreds of years later will employ millions. The individualist, the entrepreneur, the inventor are the heroes of Rand's world, and I enjoyed Follett's world for the same reason. Thanks for expanding my authors horizon. I'll start with the needle book. Ms. Enright: I always respond to these columns. It is a good columnm, so how could an author who writes like Rand be of the Labor Party? Because he doesn't understand he writes like Rand, and likely is not familiar with Rand's work. If he is, he probably doesn't agree with her ideas. I shall look forward to your comments if Mr. Follett responds to you. There's extensive material on his website about the craft of writing but it never mentions Rand. Moreover, in 40 years of publishing (he published several books under other pen names before Eye of the Needle) he's never mentioned her or her work. Then, of course, there is his clear (albeit moderate) leftist bent, which has never wavered. Interesting parallels, but the hypothesis is a stretch. Apart from that fact that he does write in the romantic tradition and his books are very well crafted with genuinely good characters, the points you note are as likely as not to be coincidence. In any case, his books are very well written, particularly Pillars. The reason why both authors seemed similar to you is because they follow the same literary current. They are both romantics. They write abou heroes and their principles; they fight against evil and those who represent it. I trinl that literary speaking they are similar but by any means Rand inspired Follet. Now, Ayn Rand's idea of writing her novels was to teach the principles of her philosophy. Follet never has advocated them or made any philosophical defense of his characters. Don't think I think bad about Follet. I like Follet's books, they are a wonderful romantic reading for traveling long distances. You answer your own question by stating that Follett is for the Labor Party. He may indeed by an Ayn Rand fan but certainly not an Objectivist. That is sort of the difference between Suzie Homemaker and Julia Childs. They both love food, but the latter is a loving expert. Follett's "Pillars of the Earth" is one of my top five favorite novels, but he gives his philosophy away in it, as all authors do. Yes, he is a romanticist to some degree, but his realism is often overarching and it overpowers his romanticism. He revels in the depiction of squalor, uncontrollable situations and lack of volitional control of one's world and relations. He often uses this as his contrast for goodness and greatness, but he spends an AWFUL lot of time depicting the realism, as opposed to the romanticism -- and even in the end we are not completely satisfied. The image I've had when reading Follett's brilliant prose is that of the man with one oar in a dingy on a violently flooding river. Yes, he has some control and does it well, but the river (history and its power players) are moving him. Even if Follett was not influenced by Rand, posing the question leads us to similarities that make him a good recommendation to put on my reading list for personal uplift. Thanks you, Marsha! Thanks to AtlasSphere for giving us another column by an Objectivist. When you're really awake, it's astounding how you can pick up the beautiful obviousness that Ayn Rand caught when she was young and turned it into a philosophy. It is just so wonderful to find a like-minded author, even if he/she got it from just being. Reading behavior that includes this thought is the ultimate high. So good of Marsha Familaro Enright to recognize this and bring it to our attention. Yes, thanks!!!!! A pleasure to read so many perceptive observation about Follett's novels and Rand's possible influence on him. I've been an avid fan for years. PILLARS OF THE EARTH gets my vote for his best work--at least, so far. I have long considered Pillars one of my favorite books, but never considered the parallel beteween Follett and Rand. Is it even conceivable that an author who majored in philosophy has not read Rand? I would think it possible as I had taken 3-4 philosophy courses in college without even a whisper of her name. I believe "60 Minutes" did a profile of Follett a couple of years ago. And, I believe he is a self-described "Champagne Socialist", but I could be wrong. . . . .